May 28, 2010 — Garmin International Inc., a unit of Garmin Ltd. a global leader in satellite navigation, announced that the Federal Aviation Administration (FAA) has granted a supplemental type certificate (STC) for the Garmin’s G500H, an all-glass avionics system designed specifically for the VFR Part 27 helicopter market. The STC is for the Bell 206-series and Bell 407 helicopters. The G500H is optimized for the rotorcraft market and it builds upon the best features of the G600 and G500, which are for the fixed-wing aircraft market. The G500H offers capabilities such as over 900 SafeTaxi airport diagrams, optional helicopter synthetic vision technology (HSVT™), optional XM WX Satellite Weather with NEXRAD, and the option to display video from a forward looking infrared (FLIR) camera or other video sources. Available in two versions – one with the PFD on the right, the other version with the PFD on the left – the G500H offers maximum installation versatility. The PFD screen displays attitude, airspeed, vertical speed, altitude and course/heading information, and the MFD shows detailed moving map graphics with the helicopter’s current position in relation to terrain, chart data, navaids, and flight plan routings. The G500H communicates and integrates with Garmin’s other panel mount products, such as the GNS 430W/530W series. Recognizing the importance of keeping track of personnel and mobile assets, the G500H is also compatible with Garmin’s new GSR 56 Iridium transceiver. This optional and affordable worldwide position tracking solution enables aircraft location data to be monitored via web-based displays on authorized base-ops computers. Customers may interface the G500H with Garmin’s TAS and TCAS I traffic systems, the GTS 800, GTS 820 and GTS 850, which are optional equipment. The Garmin traffic systems combine active and passive surveillance data to pinpoint specific traffic threats. The G500H is available immediately for an expected introductory price of $24,995. The G500H includes the GDU 620 display/control unit, GRS 77H AHRS, GDC 74H digital air data computer, GMU 44 tri-axial magnetometer, and GTP 59 temp probe. 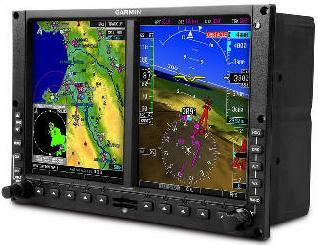 Garmin’s HSVT is also available immediately as a G500H option for $7,995. Additional information about the G500H or Garmin’s complete line of helicopter products is available at garmin.com/helicopters.